Panamera. Remember the name. It is a ground-breaking car for Porsche, marking the first time that the vaunted German has delved into the four door Gran Turismo sedan business, and it is, to say the least, a huge leap of faith for the company. But the Panamera delivers and then some. It has astonishig acceleration, a gorgeous, bespoke interior, and strong hints of Porsche sports cars in its appearance. 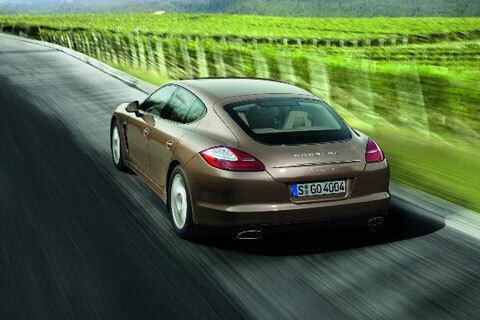 For 2011, it has introduced two entry level models, the Panamera and Panamera 4, both of whichare now on sale. 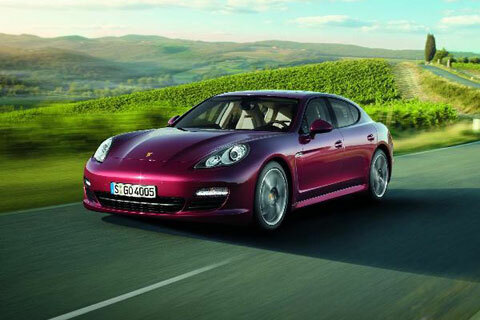 They join the existing V-8 models, the Panamera S, Panamera 4S and the Panamera Turbo. The Panamera and Panamera4 both will have a new 3.6-liter V6 with Direct Fuel Injection (DFI) developing 300 horsepower and 295 lb-ft of torque. The Panamera has rear wheel drive, while the Panamera 4 comes standard with active all-wheel drive. U.S. models will include Porsche Doppelkupplungsgetriebe (PDK), Porsche’s well-regarded seven-speed double-clutch gearbox, as standard equipment. Porsche says that the Panamera and Panamera 4 “are examples of the Porsche Intelligent Performance development strategy. Equipped with the PDK gearbox and the Auto Start Stop function, Porsche expects these new models to be considerably more fuel efficient than their normally aspirated V8 siblings. Official U.S. EPA fuel economy figures will be announced closer to the new models’ on-sale date, and both meet the strict EU5 emission standard in Europe and the LEV standard in the United States. And like all Panamera models, they are not subject to a gas-guzzler tax.” Porsche has always focused on superior efficiency and performance, and in the case of these new Panamera models these long-held tenets are not mutually exclusive. The new models feature axles, doors, hood, front fenders and tailgate all made of aluminum. The new V6 is about 66 lbs. lighter than the Porsche V8 in the Panamera S and 4S. The Panamera and Panamera 4 MSRPs are $74,400 and $78,900, respectively.